H.E. Lho Orgyen Drodul Dorje Rinpoche, also known as Karma Ratna Rinpoche and was recognized by H.H. Dalai Lama and H.H. Drikung Kyabgon Chetsang as the Quality Emanation of the great Drikung Treasure revealer Lho Nuden Dorje. Ratna Rinpoche resides at Tso Pema Monestary in India with his family. 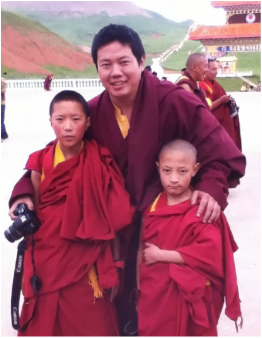 He travels with his father, Lho Ontul Rinpoche, throughout North America and Europe teaching the buddhadharma to students in the Tibetan Buddhist tradition. Ogyen Rangjung Drodul Dechen Dorje Rinpoche was born in Zahor (Mandi), Northern India on 10th June 1980, the 16th cycle of the Iron Monkey year according to the Tibetan Calender, to Ontul Rinpoche and Tashi Dolma La. Before and after his birth there were many auspicious signs. Before his birth the Yogi Kunzang Dorje, a close disciple of the Great Siddha Karnor Rinpoche, had a dream where Ontul Rinpoche came to him and said that he thought Lama Lhowa had been reborn. Just before his son's birth, Ontul Rinpoche had a dream that the great Yogi Chung-Ga Rinpoche offered him a red scarf. After his birth the Retreatant Tashi Gompo told Tashi Dolma La that he saw a rainbow stretching from Mandi, where Rinpoche was born, to Tso Pema, where his monastery is. He said that this is an auspicious sign and the baby could be someone of great scope. He further told her that she should keep the young baby clean, meaning look after him carefully as he is someone special. When Rinpoche was young he had what looked like a Tibetan Syllable on his tongue, and on the top of his head you could clearly see the shape of a Tri-shul (3 pronged trident). In a prayer, Gyalwai Nyugu (1903-1925), the fifth incarnation of Lho Drongtrul foretold: “During this time of degeneration, I will manifest into five different bodies.” Lho Drongtrul is the head of the Lungkar Monastery in Nangchen, Kham, Tibet. Since 1999, Terton Zogchen Thubten Chokyi Nyima Gawai Norbu Rinpoche, a highly accomplished master and manifestation of Terton Ratag Palsang, had several vivid visions that the child, Ogyen Rangjung Drodul Dorje, was the 'incarnation of quality' of the fourth Lho Drongtrul, Ogyen Chechok Nudhen Rolpai Dorje (1835-1902). Following these visions Rinpoche was officially recognised on April 14, 2003 by His Holiness the Dalai Lama and His Holiness Drikung Kyabgon Chetsang Rinpoche as the 'incarnation of quality' of the fourth Lho Drongtrul. He had a preliminary enthronement in Lumbini, the birth place of Buddha, on March 6, 2004. The elaborate enthronement took place a year later on the 16th February at the Wogmin Thubten Shedrup Ling Monastery in Tso Pema. In 1985 Rinpoche started learning Tibetan and English from Tashi Dolma La, and in 1987 Rinpoche started studying at an English Medium School, in Sikkim. He joined Drikung Jangchub Ling Monastery in Dehra Dun where he studied Buddhist Philosophy and Tibetan grammar in 1988. That is also where he took his monks vows from His Holiness Drikung Kyabgon Chetsang Rinpoche in 1989. Rinpoche then moved to Dzongsar Institute in Bir where he studied Buddhist Philosophy from 1997 to 2005. There he studied under Khenpo Kunga Wangchok, Khenpo Choying Lhundup and others. He also received the Manjushri Transmission from Dzongsar Khyentse Rinpoche. In 1987 he received the Kalachakra Empowerment from His Holiness the Dalai Lama in Bodh-Gaya. Then in 2000 he received, from Sakya Trinzin, the Phur-Pa Empowerment, and later the same year he received, from His Holiness Drikung Kyabgon Chetsang Rinpoche, the uncommon oral transmissions and empowerments of the Drikung Kagyu Lineage. Also that year he received from H.E. Garchen Rinpoche the uncommon Drikung Kagyu Fifty Blessings Empowerment. During the Dragon Year of 2000/01 Rinpoche received the Drikung Kagyu Protector Empowerment, Gong-Chik Teaching and Yangzab Empowerment from H.E. Garchen Rinpoche. Later that year Ontul Rinpoche gave him the ritual practice 'The Essence of Mahayana Stages of Dharma' by the Great Yogi Shedang Dorjee, and oral transmission and empowerment of 'the Establishment of the Essence of the Hearts Great Bliss' also by Lho Nuden Dorje. He further received Chod Empowerment (Rainbow Body Establishment) and oral transmission of the eight volumes of Lho Nuden Dorje. Rinpoche attended Sherab Ling Monastery during 2006 and received the Rinchin Terzod Empowerments from H.E. Tai Situ Rinpoche. In 2007 Rinpoche took a 5-day trek to Lapchi to do a 3-month retreat in the caves there. Lapchi is the holy place of Milarepa and it was from within these caves that Milarepa first realised the true nature of the mind. Rinpoche is now in Tso Pema and working hard on setting up the academy and furthering his studies and meditation practice. He also visits his main seat at Lungkar Ogmin Thubten Shedrup Ling Monastery in Nangchen, Tibet, as often as possible.